The word overflow means to have the contents flowing over or spilling, as an overfull container. So, let me get this straight… the purpose for my life is not that I be a world-renowned neurosurgeon? Whew! What a relief! One of the MAIN purposes for my life – and for your life – is to share God’s wonderful love with others. What others? ALL the others! Anyone and everyone! That, I am sure, we can do! Real love is not found in a heart-shaped box of chocolates. The only surprise in that box is about ten more pounds on your thighs! No… Valentine’s Day is all fine and good for the romantic in all of us, but real love from God is where we find true joy and do the most good for our fellow-man (and woman). Think about this: If God IS love, then anyone who doesn’t have a relationship with him through His Son, Christ Jesus, can only be described as selfish and self-absorbed in nature. It’s just a thought to ponder. If there is no other source from which we can obtain real love – then those who don’t know God do not know real love or have a clue how to show real love to others. I’ve said it before, but it bears repeating: the devil imitates and copies everything that God does. There is a false, fake, second-rate imitation of love that looks very close to the love of God – but it’s not OF God. I’m sure those who are under its influence believe it is from God Himself, but it’s not. To rest in our Lord’s strong and loving arms is wonderful indeed; however, His embrace is not to be selfishly hoarded. God’s love is to be showered on others. His Word is not only to be read and heeded – it’s to be shared through preaching and teaching. We have to be very careful, especially in this modern-day, where everyone has a voice and knows how to use it. Social media’s jam-packed with all sorts of quotes and sayings that seem sincere, but they don’t hold water theologically. Study the Bible for yourself to make sure you know God’s real love! Read God’s Word daily – be aware of what HE says, in His loving and lovely way. Let Him be the light that guides you and your path will never be dark. Once you know His love, you’ll never be the same. Sometimes I feel like a weirdo – a fish swimming upstream, waving at everyone swimming in the “right” direction… I’m like – “Bye bye… see ya!” I like to take personality quizzes and took one recently on facebook. Here are the results. I don’t know whether I feel better about my personality or not. Your Enneagram personality type is the Individualist. You’re creative, very intelligent and fiercely independent. You’re driven by the desire to live true to yourself and you’re willing to stand out from everyone else in the process. When unbalanced you tend to be melancholy and envious of others, but if you trust your inner voice you have an impressive imagination that can change the world. You may feel like a rebel without a cause, but when you’re in touch with your inner drive, your unique voice can take you far. Be yourself, never compromise on your vision, and find creative ways to express your reality. You have the potential to be one of history’s greats! Today is the day to stay in your pajamas and take advantage of the bargains available online! There are literally tons of deals out there, so no matter what you are shopping for, there is surely a bargain waiting for you to find it. Lucinda is a talented poet and contributes regularly to my blog. Her book “Coffee with Jesus” has been my go-to devotional for many years. Every week I read a poem and companion Scriptures. Her words inspire and encourage my spirit to do the things that God has called me to do. Her poem “The Napkin” is particularly inspiring – and mine serves as a reminder of the sacrifice that Christ made to save me for eternity. I could imagine a table setting with these napkins being so lovely at Christmas. What a unique touch for a family gathering! I cherish mine and keep it displayed year around. There’s just something about having a journal to jot down thoughts as you have devotionals. Sometimes the Lord speaks and inspires us and it’s great to have this companion to “Coffee with Jesus” close by when God inspires us – right? When you buy the book today, this wonderful journal (a $6 value) can be yours for free! And wow – upgrading to hard cover – how great is that??? Since this is a devotional book and will be used time and again, year after year… I mean – when it’s a paperback, it will begin to show wear so much sooner than the hard cover would! That’s a fantastic bonus, isn’t it? Today’s the day to buy “Coffee with Jesus” and choose a bonus! Decisions… decisions! Twice-Told Tales by Nathaniel Hawthorne. He has been called America’s first great Christian writer. If you like a bit of mystery thrown in as you learn, you’ll enjoy the Reverend Hooper in The Minister’s Black Veil. His veil, like the gray cross on some of our foreheads on Ash Wednesday, proclaims the sinfulness of our hearts and forces us to reckon with it before God, alone. I like this book because it’s a compilation of short stories, so I don’t get bored. Think Well On It: Consideration on the Great Truths of the Gospel by Richard Challoner. Well written and thought-provoking. If you want to meditate and deepen your understanding of the Bible, this is a great book to help you. The Imitation of Christ by Thomas a Kempis. I’m only on the first chapter, but it sets a great tone for Lent. It talks about how we need to deny our own vanity – and all the sins to which it leads. The Power of Less: The Fine Art of Limiting Yourself to the Essential in Business and in Life by Leo Babauta. By setting limits for yourself and making the most of the resources you already have, you will be happier and feel lighter in your own life. Contentment in Christ alone is what we all want. He Leadeth Me by Walter J. Ciszek. God has powerfully used this book in my life. The Secret Diary of Elisabeth Leseur: The Woman Whose Goodness Changed Her Husband from Atheist to Priest by Elisabeth Leseur.This inspiring book gives you a splendid example of how to live as a Christian in a secular environment that can be indifferent or hostile to your Faith. For Elisabeth Leseur had two great loves: God and her husband Felix, who was an atheist. Felix loved Elisabeth as well; yet to their mutual sorrow, he couldn’t share the life of the Spirit that Elisabeth cherished.Occasionally the happiness of their life together in upper-class Parisian society was shattered by Felix’s frustration and impatience. How could such an intelligent woman waste her time, as he saw it, with ignorant superstitions? Sometimes he and his friends would even ridicule and mock her faith.But Elisabeth loved Felix too much to allow their home to degenerate into an emotional war zone. She realized that confrontations and arguments were useless; she chose instead to keep quiet and pray for Felix. In her secret diary she recorded how she used his efforts to destroy her faith as means to grow in love for him and for God.Throughout their life together, it grieved Elisabeth to think that Felix might be separated from her for all eternity because of his rejection of God.For her, life in Heaven wouldn’t be happy without him. Yet when she died prematurely, Felix was still an unbeliever.The story doesn’t end there. When Felix found this diary, he discovered how Elisabeth’s whole life bore witness to the truth of the God she loved. In time, Felix was transformed by the diary and his memories of Elisabeth. He became a Christian and, later, a priest. Now she may even be declared a saint. Elisabeth’s diary and spiritual writings (all included in this one volume) map out for you a path to marital harmony and greater love for God — especially if you love someone who stands outside the Faith. Let Elisabeth’s two great loves, and her faith and perseverance, inspire you now. This is an amazing book, an amazing journey which brought me to tears more than once. I Believe in Love by Fr. Jean C.J. d’Elbee. Based on St. Therese’s little way, it stresses confidence in and abandonment to Jesus. I’m reading it a few pages at a time. It’s written with such depth that a little dab will provoke thought and provide inspiration. Lovingkindness by Sharon Salzberg. A life changing guide about prayer. It helps us discover how to increase loving thought and feelings toward family, then friends, then people we are ambivalent about, then people we dislike and eventually, all people. It’s a perfect book for our journey to become more like Christ. Heart of the World by Hans Urs von Balthasar. Pure paschal poetry of distilled Gospel. I am actually very partial to one particular book – and I’ll bet you know what one! 😉 I want to encourage you to read Lucinda Berry Hill’s A SECOND CUP WITH JESUS, the follow-up to her popular book, COFFEE WITH JESUS. Both of the books are excellent, but of course I’m going to recommend the one that she so graciously asked me to write prayers to go with her wonderful poetry. I want to share the poetry for both books, in which Lucinda so cleverly used the titles of the poems in the book to write a poem! There are stresses associated with winter, starting with the commute to work over ice and snow! Some people don’t mind driving on ice, but I’m not in that club! If I turn a corner and just keep turning – well, let’s just say I don’t find it amusing. Then once you get where you’re going, there are unique stress factors depending on the day. Stress is just a part of life, isn’t it? How do you de-stress? Chelmsford Tea is a wonderful place to rekindle friendships. Just a quaint little shop, they have hundreds of blends to choose from. They brew up a little cup of heaven – and it just melts the stress away. My mother’s favorite tea was Earl Grey. I don’t particularly care for it – my tastes gravitate toward more sweet flavors, as did my Granny LaVella’s. Right now I’m enjoying a cup of Sweet Cinnamon Orange from my favorite tea store, The Spice Merchant, in downtown Wichita. Sweet Cinnamon Orange tastes like Harney’s Hot Cinnamon Sunset. I’m sure Granny would share it with me… oh if only! When I was younger I hosted casual tea parties. I put the kettle on and had various flavors to choose from. Everyone picked their favorite and made their tea. We’d sit around enjoying our tea as we talked about life in general – literature, work, family. There was never a moment of silence, but so much laughter in my house… making sweet memories with my friends! Here’s my favorite poem from Lucinda Berry Hill, author of “Coffee with Jesus” & “A Second Cup with Jesus”. I knew my friend, Judy Janowski, author of Life is a Garden Party, would have some beautiful tea cups and teapots to share today. Look at these – aren’t they pretty? That last photo looks like she’s about ready to sit down and write her next book, doesn’t it??? Hint, hint, Judy! These days, my husband and I enjoy tea and blueberry scones together. It’s a quiet pleasure, but one that seems to make all the cares of the day just melt away… there’s just something about tea! We are in no danger of running out of teapots or teacups around here! There’s always time for tea, scones, smiles and laughter. I can’t speak for others, but in my mind, the table setting at a tea party is just as important as the tea you choose to serve. I enjoy our own Hall Autumn Leaf Jewel Tea antique dishes. They set a very pretty table and are particularly nice for an Autumn Spice themed tea party. If you think you are beaten, you are. If you think you dare not, you won’t. If you like to win, but don’t think you can It’s almost a cinch you won’t. Success begins with a fellow’s will It’s all in a state of mind. And many a coward fails ‘ere even his work is begun. Think big and your deeds will grow. Think small and you’ll fall behind. Think that you can and you will. It’s all a state of mind. If you think you are out-classed, you are. You’ve got to think high to rise. Life battles don’t always go to the stronger or faster man. But sooner or later, the man who wins is the fellow who thinks he can. YOUR WONDERFUL IMAGINATION MAKES THE ORDINARY SPECIAL. YOUR STYLE AND ARTISTRY SHINE THROUGH IN ALL THAT YOU DO. Today we celebrate NATIONAL POETRY AT WORK DAY! It’s funny, when I first heard the name of this special day, my thought was, “Poetry at a job?” Then I ran it past Lucinda and she said, “Yes, poetry is at work.” Then it clicked… yes, the words God gives us – they really DO work! This is not a blog post intended to brag on us, but its purpose is to brag on God. His faithfulness, His divine inspiration and His unending love, grace and mercy to us! We praise Him because He gives us the right words to write at just the right time. Someone once asked what it was like to be Sanctified and the answer was, “It’s better felt than telt.” In other words, you just can’t describe it, but you know without a doubt that God’s Holy Spirit is there with you throughout your life – no matter what. It’s this Spirit that leads us to write – tells us when to write and what to write. God alone knows what words a soul needs to read – and when they need to read them. I can’t speak for Lucinda, but there are moments when I wonder why I’m writing what I’m writing and why I’m writing those words at that particular time – but I just have to trust that God knows best – and yes, I know He does! 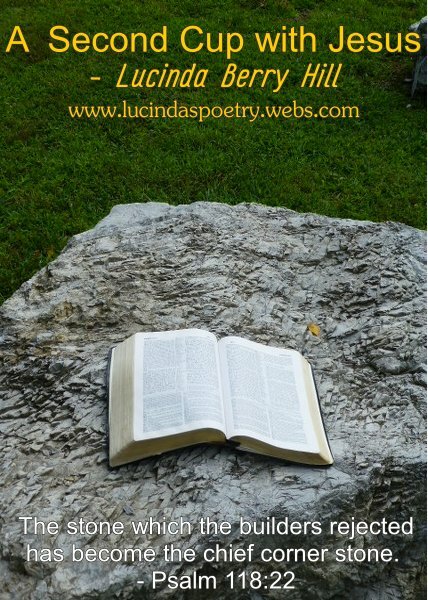 It’s my prayer that the poetry Lucinda and I write touches lives and encourages individuals in their spiritual journey with Christ. We pray His richest blessings on each of you. If you find prayer to be a bit intimidating like I do, read “Before Amen” by Max Lucado. Would you like to go on a great adventure and make some new friends along the way? May I suggest you pick up a book today? Between the covers of a book are untold treats for the mind’s eye. When I walk into a bookstore my brain kicks in and my heart beats faster. Today is BOOK LOVER’S DAY! What better time to explore all the different types of books we can use to make our lives richer and fuller (or maybe just get a good laugh). There are several different sections to choose from in your local library or bookstore. Maybe you’re not interested in going on a wild adventure today, maybe you just want some specific help with something personal. I find the Self-help section very useful and have landed there many times. Our local library has a Travel section that catches my eye when the weather is bleak and I have cabin fever during the winter months. Those books – any of them, can transport me from Wichita in winter to anywhere I want to go. It’s like a great vacation for my mind which ultimately improves my mood and attitude as well. How about a Thriller? As long as it is broad daylight and I’m not alone in the house, it’s okay on occasion. I enjoy a good Biography now and then. Although fiction tickles my fancy once in a while, I enjoy the real life stories of people who have shaped the course of history. The “killing” books that Bill O’Reilly has published come to mind – and they are very well researched and keep me turning pages for hours. There are sections called Creative and Art, respectfully. Whether you are interested in learning a craft or you just wish to appreciate art, there are plenty of books available. The Religious section does, of course, interest me. I have favorite authors such as Max Lucado and Billy Graham (of course, his latest project was in the form of a video called My Hope for America) I’ve posted that video on my blog, but would encourage you to watch it on YouTube. At 95 years old he is still pleading with us to pray and seek God’s face and turn from our wicked ways. There is a special place in heaven for that man.